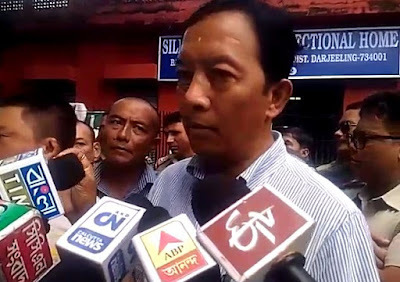 Rebel Gorkha Janmukti Morcha leader Binay Tamang today sought to take credit for the Centre's formation of a committee to look into the Darjeeling issue, saying it was his letter to Union home minister Rajnath Singh that led to the move. "On September 3, after I was made the chief coordinator of the party, I wrote to the Union home minister mentioning that if any tripartite talks are held on the hill issue, I should be called. On October 10, after I took charge at the GTA, I sent another set of letters. It was yesterday that I learnt about the committee and I feel that it was done because of my letters," Tamang said. The Centre has formed a high-level committee of officials to initiate a composite dialogue with the Mamata Banerjee government and Morcha representatives to find a solution to the Gorkhaland issue. The third round of bipartite talks between the Bengal government and the hill parties are scheduled for September 16 in Nabanna. The Centre is yet to decide on a date for the tripartite talks. Asked if he would attend the tripartite talks if Morcha chief Bimal Gurung was invited, Tamang said: "We feel some legal hurdles might crop up if a person, against whom charges have been clamped under the UAPA and who is wanted in several cases, is called for such talks. We believe the Centre also knows it." Tamang will head for Calcutta tomorrow and is slated to meet the chief minister in the afternoon. He will meet the governor on September 15 and attend the talks with the state the day after. Tamang today appealed to tourists to visit the hills with a promise of security. "We welcome tourists to the hills and would like to assure them that all steps would be taken to ensure their protection. Peace and normality have been restored in the hills," he said.